Our inaugural Easterseals Art Show hosted by State of the Arts Gallery was an incredible success opening night! 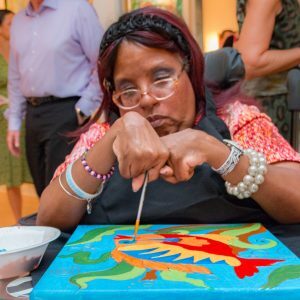 The evening had the perfect ingredients: fabulous art by our Easterseals artists, art patrons and a spirit of celebrating abilities shining! To see all the pictures from the Art Show, check out our Facebook page. This evening would not have been possible without Barbara Banks, Melissa Howard, Mimi Carlin and hosts, Tre Michel and David Steiner. The Art Show also kicked off our online website where a variety of artwork is available for purchase. Check it out by clicking here. Our artists are compensated for every sale. Shoppers are also welcome at our campus on Braden Avenue to see the latest artwork and meet our incredible artists!